Denna produkt ger dig 2395 bonuspoäng. Stolpvagn typ R10 typ med last av trä, längd över buffertar 37,5 cm, epok III. Prototype: German Federal Railroad (DB) type R10 as it looked in Era IIIb. Used to transport sawn logs. Car number 405 092. 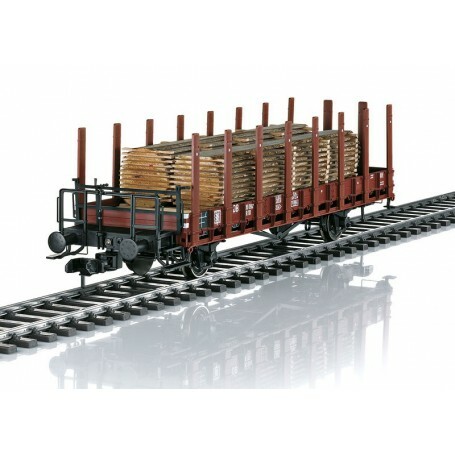 Model: The car has a brakeman's platform and a brake handle that can be turned. It also has many separately applied details such as the brake air tank, brake lines, brake shoe holders, brake crank, and brake rigging. The car has 2 sawn logs of real wood on an appropriate load frame. Prototype couplers are included. The minimum radius for operation is 1,020 mm / 40-3/16'. Length over the buffers 37.5 cm / 14-3/4'.